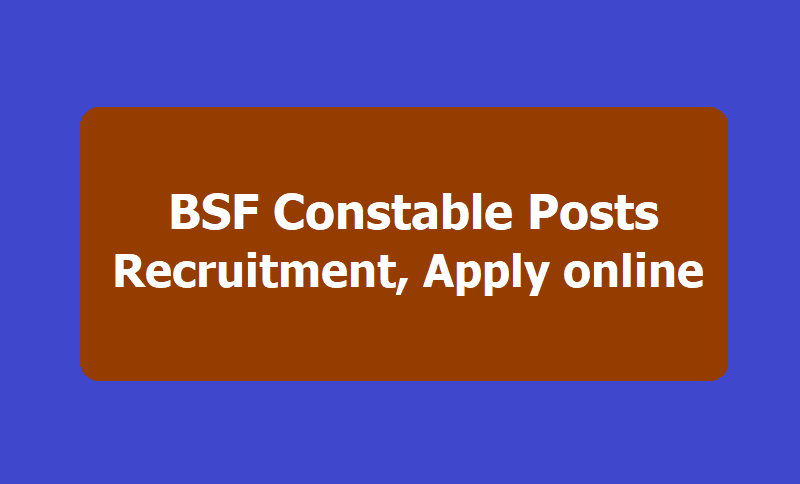 Border Security Force/BSF has given notification for the recruitment of Constable Positions and applications are invited from the eligible Indian citizens for filling up following posts of Constable in BORDER SECURITY FORCE in the pay band -I Rs.21700-69100 and other allowance admissible allowances to Central Govt. employees from time to time. The posts are temporary but likely to become permanent. So, Border Security Force (BSF) conducting recruitment rally for the post of Constable in CAPFs & AR. Eligible candidates may attend for Recruitment Rally at PST & PET centers as per the schedule. Other details like age limit, educational qualification, selection process & how to apply are given below. Border Security Force, BSF has invited candidates to fill up Constable posts for the organization. A total of 1763 posts of Constable will be filled up. Candidates can apply for the post through the official site of BSF at bsf.nic.in. the last date to apply for the post is within 30 days (March 01, 2019) from the date of publication of advertisement in employment news. Educational Qualification: Candidates should have passed Class 10 or equivalent from a recognised with two years work experience in respective trades. Candidates will fall under pay scale Rs 21,700- 69,100/- and other allowances. Candidates can visit the official notification for more details. Those with two years Diploma from Industrial Training Institute in the trade or similar trade are also eligible to apply. Candidates must be between 18-23 years of age as on August 1, 2019. "Relaxable for candidates of SC/ST/OBC category and other special categories of personnel in accordance with the instructions issued by Central Govt. from time to time," reads the job notice. Candidates should download the application format available in the official website of BSF at bsf.nic.in. "The application form and admit card duly filled up by the candidates may be sent to concerned Recruitment Agency (BSF HQRs) under which their State falls along with recent passport size photographs, examination fees & other required documents," the job notification adds further. Closing date of application: Within 30 days (March 01, 2019) from the date of publication of advertisement in employment news.